As any litigator knows, a jury is a group made up of a collection of different people from a particular jurisdiction. There is only one guarantee when presenting a case before a jury: each person is going to have a different opinion and base it on different reasons. This is where A2L Jury Consulting can step in and be especially useful. We will organize a focus group and/or mock jury to test out a trial team’s case themes and legal arguments before bringing them in front of an actual jury. Why Are Focus Groups Necessary? Because focus groups can show attorneys the strengths and weaknesses of their current litigation strategy in the eyes of the typical juror. Jurors come in all varieties and thus have different likes and dislikes, come from different family backgrounds, have different education levels and are prejudiced by different things. While one juror may be completely convinced by one argument, there is another who most likely will take the opposite view. Focus groups are a useful jury consulting instrument in determining how the trial team’s arguments and theories are received by people that have similar makeup to those that will comprise your jury pool. Focus groups, led by our experienced jury consultants, are groups of usually six to eight people pulled from the jurisdiction’s potential jury pool and given an opportunity to discuss the strengths and weaknesses of a case. The trial team observes the group as they discuss the case themes and legal arguments. This helps determine the particular biases of the region of your jury pool, and can even help attorneys decide on which route to take an argument for trial. For those trial teams questioning the value of settling before trial, a focus group may be extremely valuable to avoid unnecessary litigation. When a team still determines that trial is necessary, the focus group can be vital in discovering what aspects of the case need improvement to enable the trial team to be as prepared as possible for upcoming trial. A2L Consulting has expertise in providing jury consulting services, and specifically focus groups. We can work with your trial team to conduct a focus group and help you determine which litigation strategies are effective in propelling your legal arguments and which need more work before they can be presented to a jury effectively. 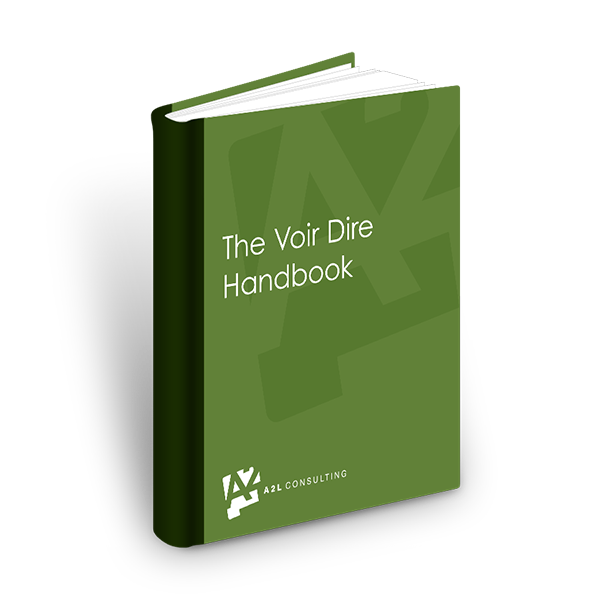 Learn about the latest trends, tactics and technology affecting jury selection and voir dire in this valuable 111-page e-book from the litigation consulting experts at A2L Consulting. This one-of-a-kind e-book is for litigators and those who support them. It's our first book compiling articles related to jury selection and voir dire.